I thought I would share my current evening skincare routine with you today. I have been using this combination of products consistently for about a month, and have seen some really fantastic changes in my skin. I have spoken about a couple of these products previously, and others are fairly new to me. These products have worked so well for me, that I am slightly anxious about changing anything. 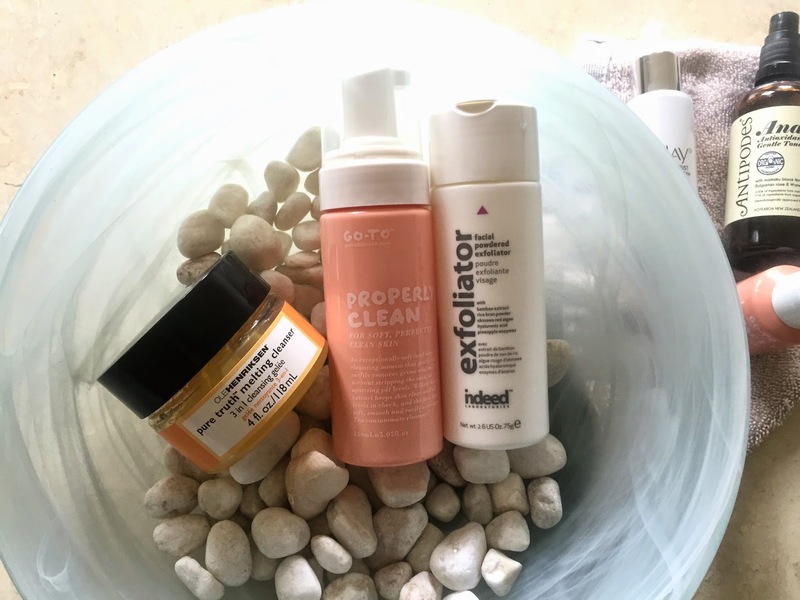 I cannot recall the last time I felt this way about a group of products, and though I still have many other product and brands loves, (and holy grail products), this combination has made my skin balanced, calm and just generally happy. As a self confessed skincare junkie, I am always trying new products. I can't help myself really... everything about skincare and skincare products intrigues me. Now that I am on the other side of 40, I am certainly noticing more fine lines, wrinkles and general signs of ageing creeping up on me. Having said that, it really is just a part of life. You cannot stop ageing...time marches on folks, let me tell you. Aside from protecting your skin from the sun, and your genetic predisposition, your skin will eventually show signs of ageing. Thankfully for me, along with getting older, comes a little more life experience, a little more gratitude, and a wider, clearer view of what really is important. I have so many stretch marks on my stomach from my four pregnancies, my skin is so stretched and it really doesn't look pleasant at all, but they are my mummy scars. I would not be without them. They tell a story, just like the wrinkles around my eyes and mouth from smiling, and the frown lines between my eyes and on my forehead from thinking, questioning and learning about life. However, that being said, I still want my skin to look nice... I still want my skin to be free of acne, and I still care about how my complexion looks, and I want it to look it's best! It may seem like a lot of products and steps, and it probably is! My evening routine is one of my favourite times of the day. My children are asleep, my husband is happily holding the TV remote, and I can enjoy a nice warm shower and look after my skin without having to talk to anyone...silence is golden folks, I'm here to tell you! As much as I enjoy applying my makeup, I think I might enjoy taking it off even more. I do all of my cleansing steps in the shower. It just works for me that way. I am not suggesting you need to do all of these things either, but I enjoy the process...it makes me happy! Yep...it takes a whole bowl! Ole Henrikson pure truth melting cleanser is a beautiful cleanser that I purchased whilst in New York last year. The tub in the picture above is in fact almost empty, and I have just repurchased another. It goes on the skin as a thick, smooth gel, and as you massage it in, it melts into an oil. It is the most beautiful texture, feels beautiful on the skin, and removes all of my makeup, leaving my skin feeling amazing. It has a beautiful citrus scent, which I love, and it has not caused me any irritation. I use it as I would a cleansing oil, straight onto dry skin. You can emulsify it with a little water, and it turns into more of a milky consistency, but I prefer not too. I enjoy the slip and texture of the oil on my skin. Once you emulsify it, you loose that slip. If the thought of using an oil cleanser scares you a little, you need to try this. It leaves absolutely no oily residue on the skin. After a nice massage, I then remove it with a clean face washer/flannel. The trusty face washer is the only skincare 'tool' you will find in my bathroom. I have a huge pile of them, and I use a clean one every day. I have not tried a clarisonic, or any other cleansing devices as yet. I am happy with my flannels so far! I like to spend a few more dollars and get the nice, soft thick ones, as they hold the warmth of the water beautifully. One pump of Go-To Properly Clean is my second cleanse. I am a fan of the double cleansing method, and it has worked well for my skin for the better part of two years now. Properly Clean is a gentle, lightweight, fluffy mousse cleanser that I love. I have reviewed it in full here. It smells heavenly, feels beautiful, and rinses away perfectly. I am coming to the end of this bottle too, and shall be repurchasing it very soon. Why does all the good stuff run out at the same time!!?? One of the more recent editions to my night time routine has been the Exfoliator from Indeed Labs. Gifted to me for trial purposes, I have indeed been trialling it ( excuse the pun ) and I love it. It follows a similar concept as the much talked about Daily Microfoliant from Dermalogica ( which I have not tried ), in that it dispenses as a powder, that you then mixed with water to create a thick, soft foam. Containing rice bran powder, hyaluronic acid, and some trusty fruit enzymes, this leaves my skin feeling smooth and generally looking clearer and brighter. I tap a small amount into the palm of my hand, mix it really well with a little bit of water for about 10 seconds between my palms until it resembles a soft foam, and then apply it to my face, avoiding the eye area. I don't really massage it in, I just softly move it around my face with my fingertips for about a minute... I prefer to let those lovely fruit enzymes do all the exfoliating. I find it to be very gentle, it rinses away beautifully, and leaves my skin feeling so soft and just lovely. Worthy of note, the price point is certainly a little friendlier than the afore mentioned... you're welcome. Antipodes Ananda Antioxidant Rich Gentle Toner is my first layer of hydration after I step out of the shower. This is my second bottle. Definitely a hydrating mist rather than a traditional "toner", I spritz my face like a mad woman, breathe in the beautiful, subtle bulgarian rose scent, and then pressed it into my skin with the palms of my hands. Glorious. I also love the People for Plants hydrating mist, and the Sukin Hydrating Mist if you are looking for a slightly less expensive alternative. My next step is to move straight onto the eyes, and the cooling metal ball and lightweight serum from the Puretopia Eye Rescue does the trick for me ( love this in the morning as well ). Vitamin E and Shea butter moisturise, whilst peptides and Vitamin C are said to reduce puffiness and brighten the eye area. I apply it along the orbital bone, starting in close to the nose and then out and up to my temple, and then pat it in with my fingertips. The tube is soft and pliable, so you just gently squeeze it to dispense a little of the serum onto the tip of the metal ball. Eye Rescue always makes my under eye area look refreshed and hydrated, without feeling too heavy or greasy. I haven't noticed a huge difference in the discolouration under my eyes ( about 6 weeks of sleep might help ) but my fine lines are certainly less noticeable! 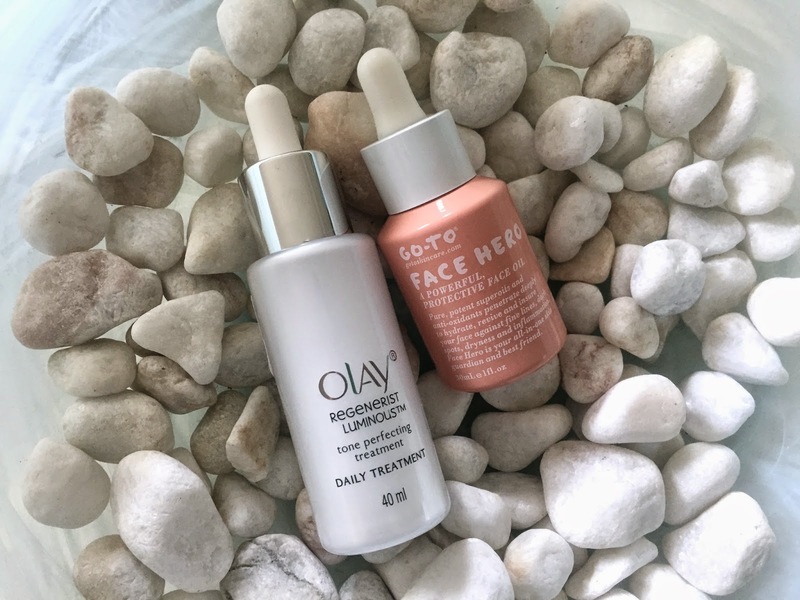 I first heard about the Olay Regenerist Luminous Daily Treatment serum when Ruth, from A Model Recommends, trialled it for Olay. She had very good things to say about it indeed, and I absolutely trust and value Ruth's opinion on skincare, so I picked it up during a recent sale at my local Priceline pharmacy. When I was checking the ingredient list in store, I was very excited to see Niacinamide was the second ingredient. Niacinamide, also known as Vitamin B3, hydrates the skin, assists in cell turnover, improves skin elasticity, and helps to reduce hyperpgimentation. I adore this serum, and have definitely noticed that my skin tone is more even and looks brightened and refreshed in the four weeks I have been using it. I also feel that it has contributed to the fading of old acne scaring. Apologies for using this word again, but it is very lightweight, and absorbs quickly and easily into the skin. I have even been using my chemical exfoliants ( AHA's and BHA's ) considerably less often since I started using this serum. I'm absolutely impressed, and would highly recommend it. I haven't even felt the need to repurchase my Estee Lauder Advanced Night Repair....now that's saying something folks. Last, but certainly not least...the final layer...the final frontier...absolutely the last layer I promise... is Go-To Face Hero, one of the most deliciously gorgeous face oils I have ever used. I was lucky enough to have received an email two weeks prior to the official launch date, with an offer to make an early bird purchase....and purchase I did! I could see a very noticeable difference in my skin after using this for two days! 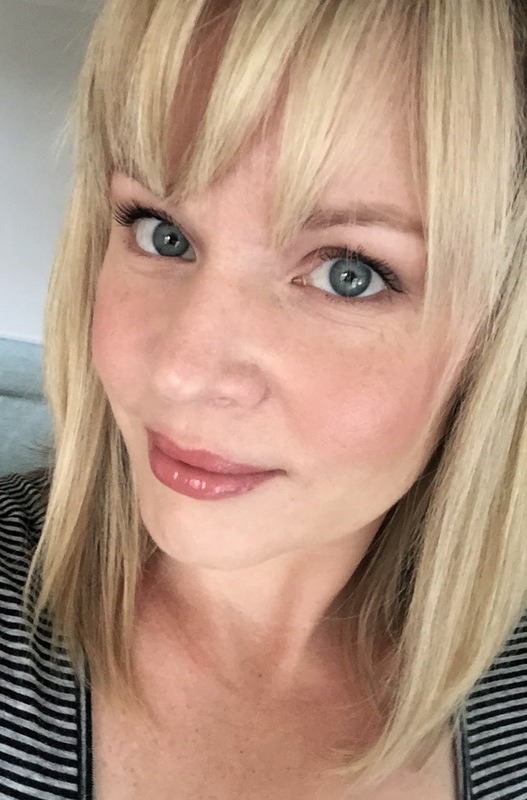 I left a comment for Zoe Foster Blake ( Go-To creator and all round fabulous woman ) on Instagram a month ago, saying that my skin was calm, happy and hydrated, and it has since stayed that way. I have also noticed a reduction in oil production, and almost no breakouts....yep, really! I'm thrilled to bits! Face Hero contains a blend of 10 beautiful, skin loving oils, including Almond Oil, Jojoba Oil, Macadamia Oil, Brazil Nut Oil, Evening Primrose Oil, Buriti Oil, Arnica Oil, Rosehip Oil, Calendula Oil, and Kiwi Seed Oil. It has a beautiful, subtle, natural fragrance of Orange Blossom and Rose Gardenia. Not at all strong or overpowering, I can still smell the earthiness of the natural oils underneath. I smooth 4-5 drops over my face and neck, and chest area every night. It has a lovely, velvety consistency which my skin just drinks up. I cannot say enough good things about Face Hero... he truly is a little bit of magic to me! Phew. You made it to the end...thank you! I'd love to know your favourite skincare products! Are you a skincare addict like me? Do leave a comment below if you would like to, and feel free to ask me any questions you may have and I'll do my best to answer them! 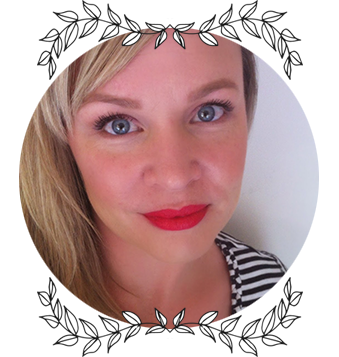 I have used, and enjoyed mineral makeup for the last four to five years. As someone with acne prone skin, I was initially drawn to it because of it's lightweight, but buildable coverage that was going to let my skin 'breathe' and not exacerbate my acne. 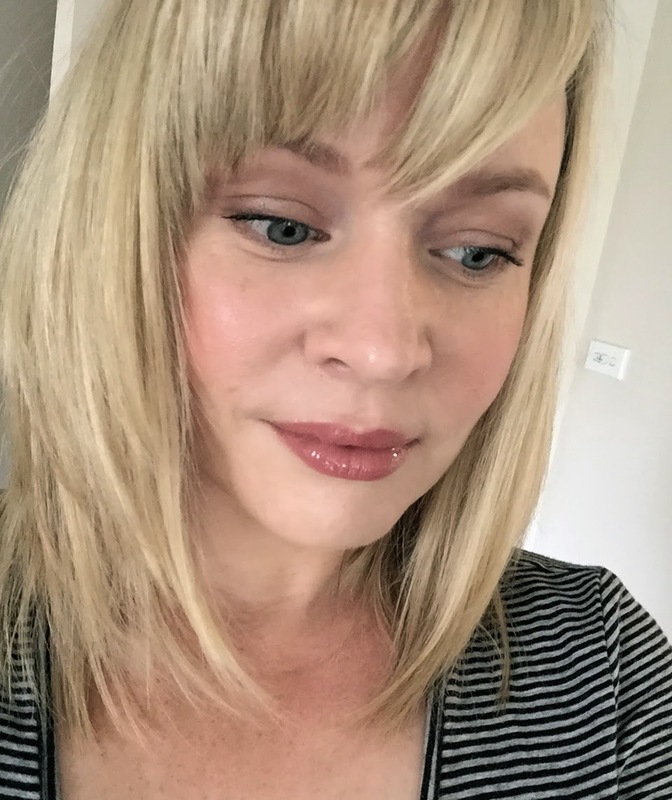 I have tried quite a few different brands and formulas over the years, and when offered the opportunity to try Youngblood Mineral Cosmetics I said yes please! 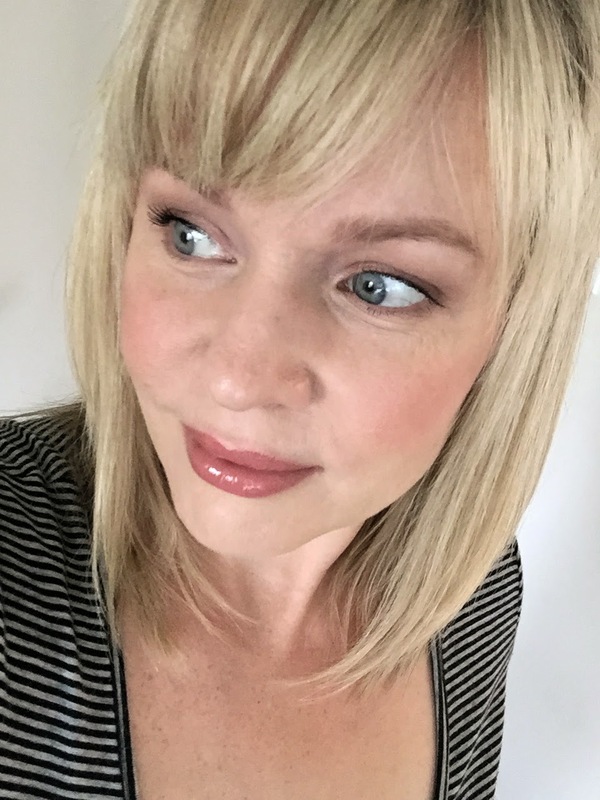 Today, I have some thoughts to share with you regarding the products, and some photographs of the makeup on my skin. I created a very quick and simple everyday look using the products below. This type of makeup look is really the only one I am good at!! I have been putting my "face on" for many years now, and honestly I do wear some sort of makeup on a daily basis. Some people may be gasping in horror, but most people who have experienced acne, or any other disfiguring skin condition will probably understand. I do try to keep things looking as natural as possible, whilst evening out my skin and giving my face a bit of colour, glow and subtle definition. I was surprised to discover that Youngblood Mineral Cosmetics were founded in 1996, almost 20 years ago! Pauline Youngblood, founder and president of Youngblood Mineral Cosmetics, used her knowledge and experience as a medical aesthetician to develop a range of mineral based cosmetics that would provide excellent coverage, whilst still allowing the skin to breathe. 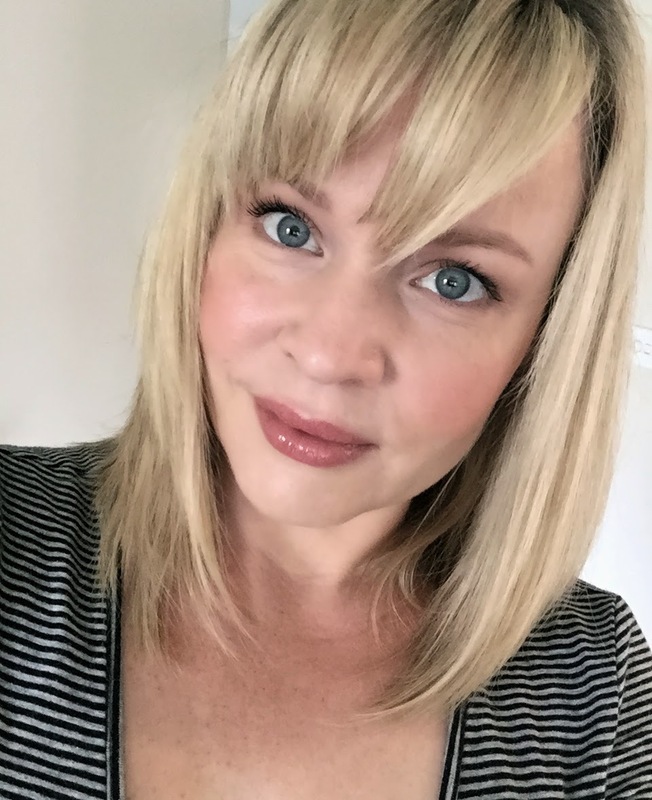 The first product developed, the Natural Mineral Foundation, and was designed for patients recovering from laser treatments, acne, rosacea and cosmetic surgeries. Free of talc, oil, parabens, fragrance, Youngblood boast luxurious, lightweight, and non-comedogenic formulas in sleek, sophisticated packaging, and are cruelty free. L-R Doe, Coco, Desert, Haze. Swatched in indirect natural light. Pressed Mineral Eyeshadows as per previous swatches. If you are familiar with mineral foundations, you may be aware that the formula's can vary greatly, depending on the brand. Some are more on the dry side, and others are more creamy. This mineral powder falls into the creamier category, and I really like it. On the skin, it gives what I would call a satin finish, not shiny or sparkly, just natural and glowing. The shade I have is in Soft Beige, which is a pretty good match for my light-medium skin tone. It has a slight yellow undertone which I prefer as it helps to counteract the redness I can experience in my skin at times. I start with a small amount tapped into the lid, pick up the powder with a kabuki brush, hold it upright and tap the base of the brush lightly in the palm of my hand. I personally like to do this, as it allows some of the minerals to drop into the bristles. When you first place the brush to your face, an overloaded brush can mean that the product can look at little heavy in that area. As I said, this is just the way I like to do it to avoid any areas looking cakey. A light hand is best with creamy formulas like this one in my humble opinion. I start on one side of my face, on the cheek area, and blend the foundation in circular motions around my cheeks, sweep it down the side of my chin, up and across the side of my nose, and then up to my temples and forehead area. I then repeat the same process on the other side. Without adding any more product, I will then spend a few minutes lightly buffing the minerals into my skin. I find that as you do this, the minerals can really blend into the skin, it perfects the finish and improves the coverage without adding any additional product. Like many cosmetic products, it is best to start with a little a build up coverage gradually. For the photographs below, I did one layer of the mineral foundation. You can still see some of my pigmentation and freckles peaking through, which I don't mind at all. I'm not about full coverage for my everyday makeup, but I think one layer gives me a nice medium coverage, evens out my skintone, and gives my skin a nice fresh look. If you compare the skin on my neck and chest area to my face, you can see the coverage that it gives. I like to follow my mineral foundations with a good spritz of a hydrating facial mist. I find that it helps the foundation to meld with the skin. Youngblood do have a variety of facial mists available, however I have not tried them. I will share some of my favourite hydrating mist toners in another post! This concealer is quite creamy to touch and easy to blend, and can be applied lightly for sheer coverage, or built up to a medium coverage. Some concealers with particularly emollient formulas can slip and slide on the skin, however this one does not. I found it best to apply with a flat concealer brush, and then blend a little if needed with my fingertips. I also used a thin layer of this as my eyeshadow primer and it worked a treat! I found that it did not completely cancel out the bluish undertones I have under my eyes, but it did diminish them nicely for an everyday look. I did have to build up the concealer over a few pesky blemishes, but it did the job nicely and I was able to blend away the edges easily. I always apply my concealer after my mineral foundation. I have never had any issues doing it this way, and find if I use it prior to the minerals I end up just buffing it away. An everyday makeup look is never without blush for me. It is a staple in my routine, and is one product that ALWAYS makes me feel, and look fresher and a little more awake than I typically feel! Blossom is a beautiful pinky/peach shade with what I would call a slightly warm, almost terracotta undertone, perfect for an everyday natural look. It has a matte finish, however the finish on the skin is not flat at all. I added a little of the eyeshadow in the shade Desert straight over the top of the blush, to give a little bit more glow ( cos when you're 40, you need all the help you can get.. ). A lovely neutral eyeshadow palette with 3 matte shades and one shimmer. The formula of all four shades is smooth and blendable. The lightest shade Doe, does not swatch particularly well on my arm, however it works beautifully as a matte highlight on the browbone. The shade Coco, described by Youngblood as a medium, warm chocolate brown also has a matte finish, and I applied it all over my lid and up into my crease. I used my finger to tap a little bit of the shade Desert, a peachy golden shimmer, onto the centre of my lid. As I mentioned earlier, I also used this shade on my cheeks, over my blush to add a subtle glow. I used the cooler, grey toned shade Haze softly along my upper lash line with a small angled brush. Using the same brush, I took a little of both Haze and Coco, and filled in my brows. These pressed shadows really adhere nicely to the skin, and I found these two shadows to work perfectly to even out my brows and give them a little bit of definition. You could certainly build up the colour if your brows are darker than mine. These eyeshadows are a pleasure to use, and quite multifunctional...gotta love that! All photographs below are unedited and were taken in natural light to try to give you the most honest representation of not only my skin, but the colours of the products that I used. I am a makeup enthusiast, not a makeup artist, and I am also not in my first flush of youth, so please be kind! 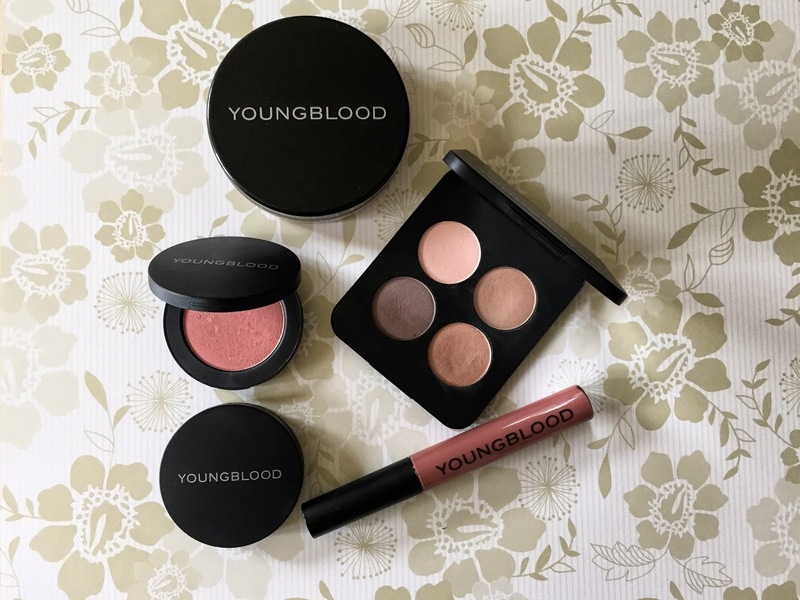 You can click the link Here to go to Youngblood Australia's website, where you will find a plethora of information and all of their products. You will also find lists of stockists, both bricks and mortar and online. I found quite a variation in pricing on some of the online stockists, so I have not included individual pricing in this post. I will say that they do tend to sit in the mid to higher end in terms of pricing, however I would not hesitate to recommend them, and would indeed spend my own money to purchase more. 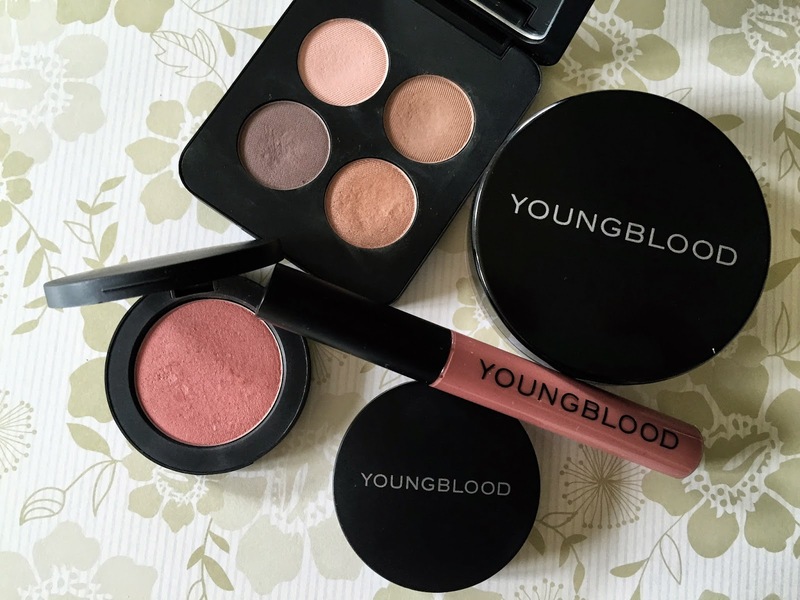 Have you tried any Youngblood Mineral products? Are you a mineral makeup lover? Let me know your thoughts below in the comment section...I always love to hear from you!